In this generation, what you write in your artist statement is very crucial especially if you are an artist who creates visual artwork. You need statement of an artist that introduces, communicates, and describe your art as a whole. A statement that does not only explain the value statement of an art but also conveys an important message. You don’t need to be a writer to create a good quality artist statement. You just have to look into your art or piece of work and find its relevance and purpose. And by then, you can create your own artist statement. To help you with that, you can check out our different formats like statement examples in pdf . 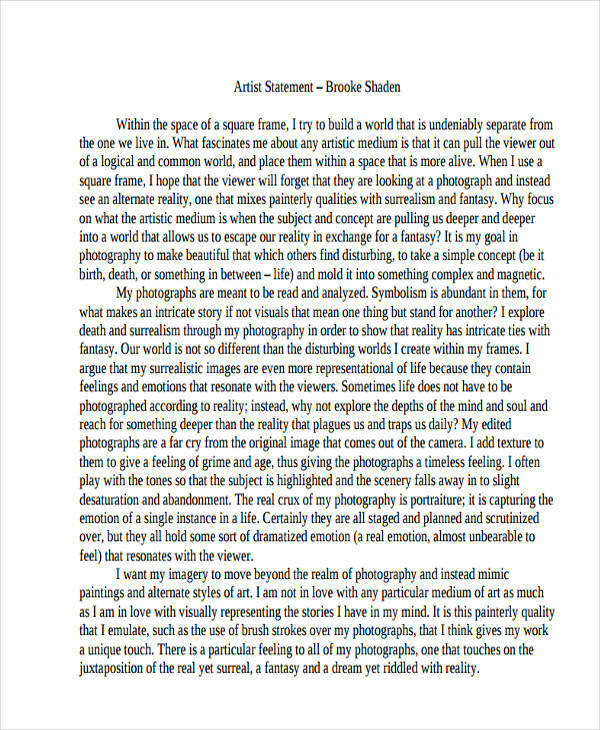 An artist statement is a didactic, descriptive, and free statement about the general introduction of the artist work, their body of work or a specific project. 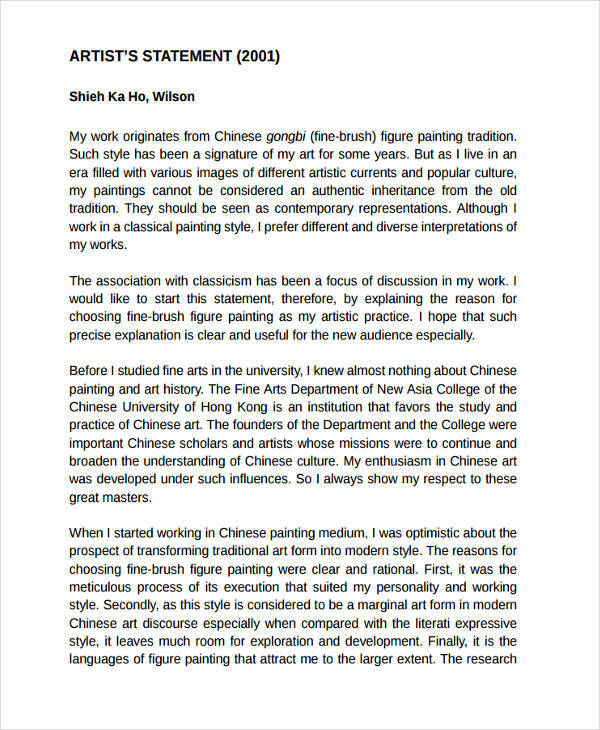 The main purpose of an artist statement is to give the viewers or readers a full understanding of the artist’s work and its concept statement. As it aims to inform, connect, and present with the work’s basic ideas and overview. 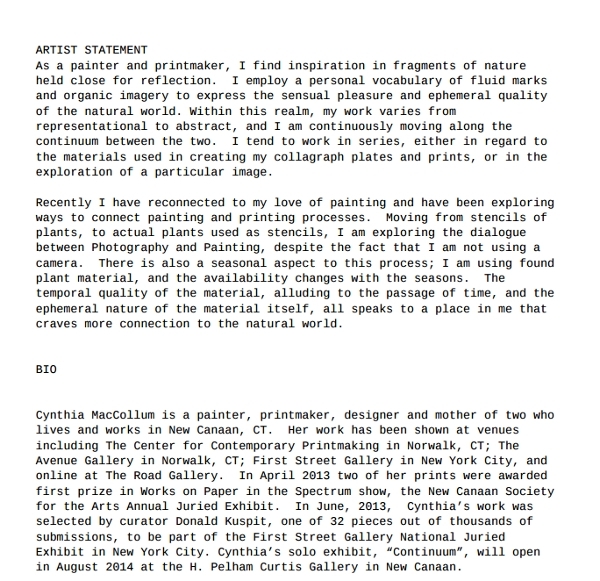 Some of the artist writes their artist statement in two or three sentences and some exceed to 500-1000-word version of their statement. The artist statement can change throughout the artist’s career as they maintain and revise it. An artist statement is essential to every artist. It shows that you are thoughtful and you are serious about your work. 1. Be honest about yourself and to your art. Understand what your art express and what it’s trying to achieve. 2. Consider your influences. Think about the things that influence your art and their impact statement. 3. Identify what you want the people to understand about your art. 4. Briefly explain and express your connection to your art. 5. Use simple language, do not write in vague. 6. Revise if it’s necessary. 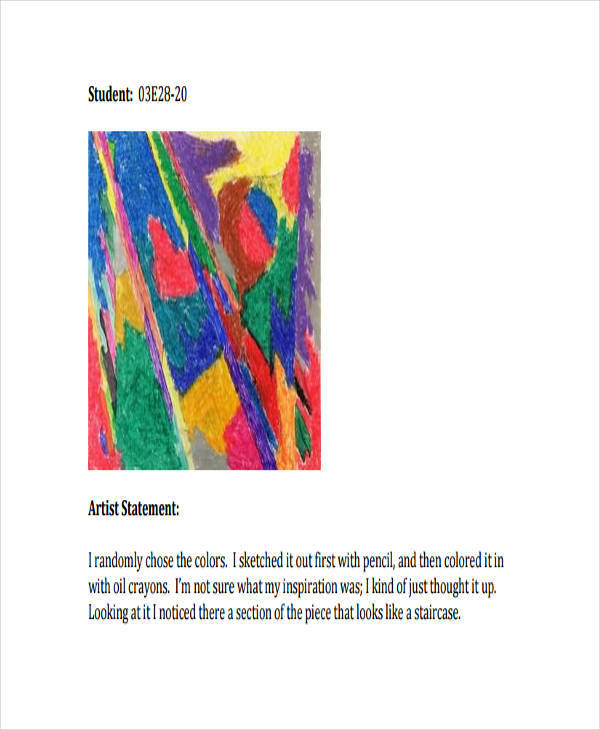 To further guide you on writing an artist statement, this article offers artist statement examples in Excel, and statement examples in Word format for easy reading and download. 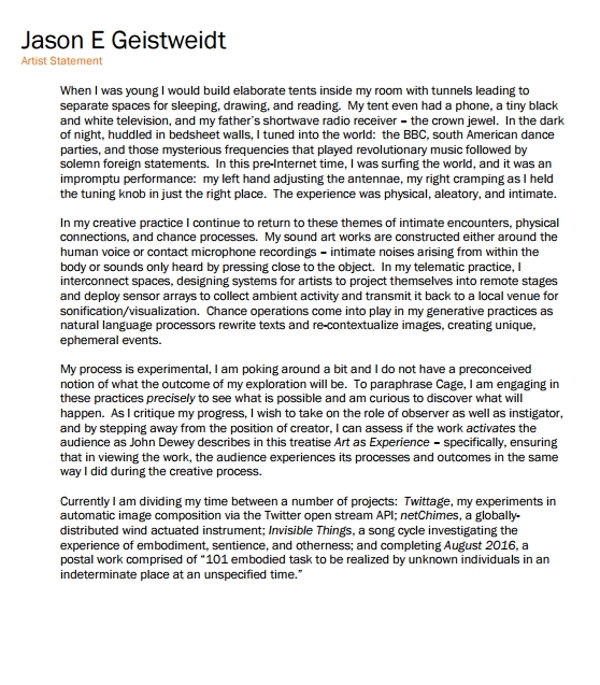 What Information Should You Include in an Artist Statement? Your artist statement should explain, contextualize, and justify your whole work. Just like a good book, it needs to have good content. 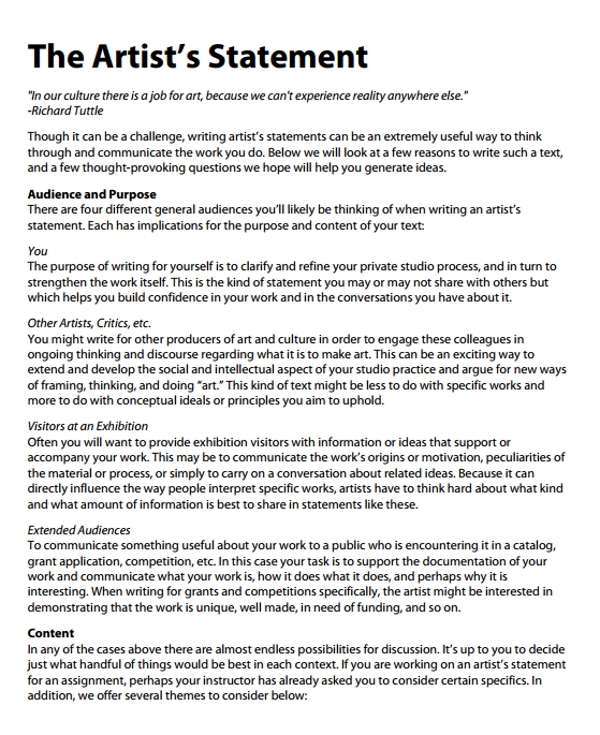 The following are the information you should include in your artist statement. Your vision about your work. 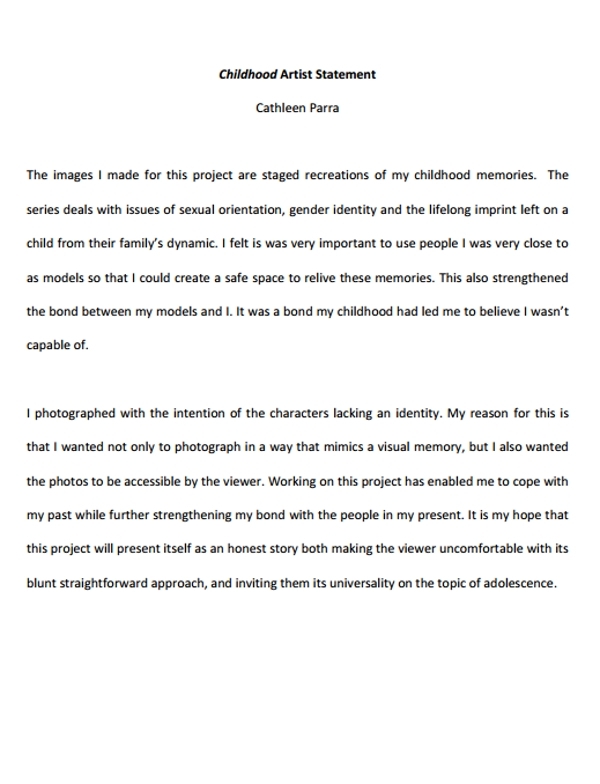 Your personal statement about your work. 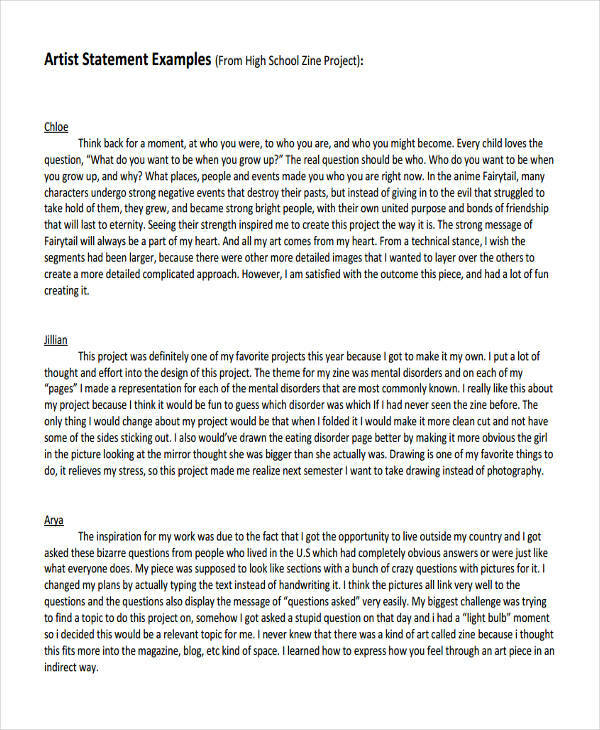 The reason why you created your work and it’s background. The expectation of the audience to your work. How your previous work relates to your current work. Your inspiration of creating your work. The people or other artists that influence you. The significance, relevance, and the purpose of your work. You may also see statement of work examples & samples. 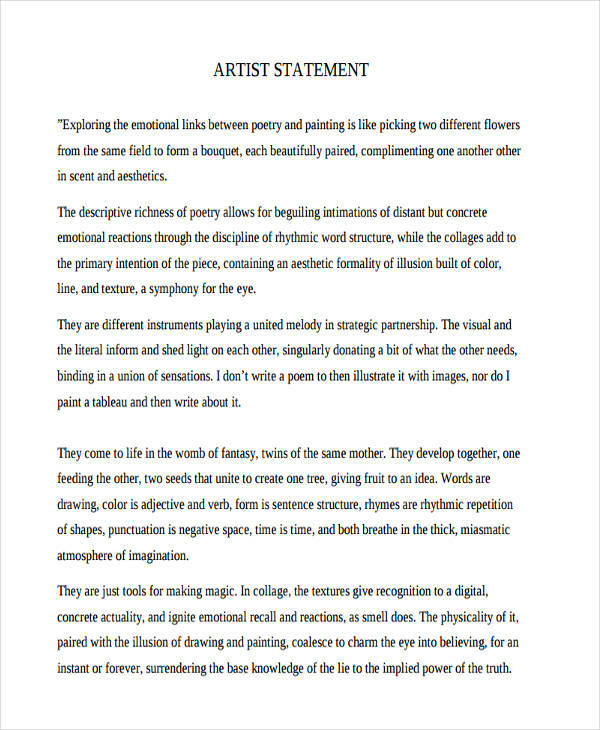 An artist statement overall provides clear and simple context without the use complex terminology. However, some artist prefers to make their statement deep and “thought-provoking” that is suitable for their abstract work of art. Nevertheless, they all end it with a strong summary writing of their art. Here’s how to close an artist statement. 1. 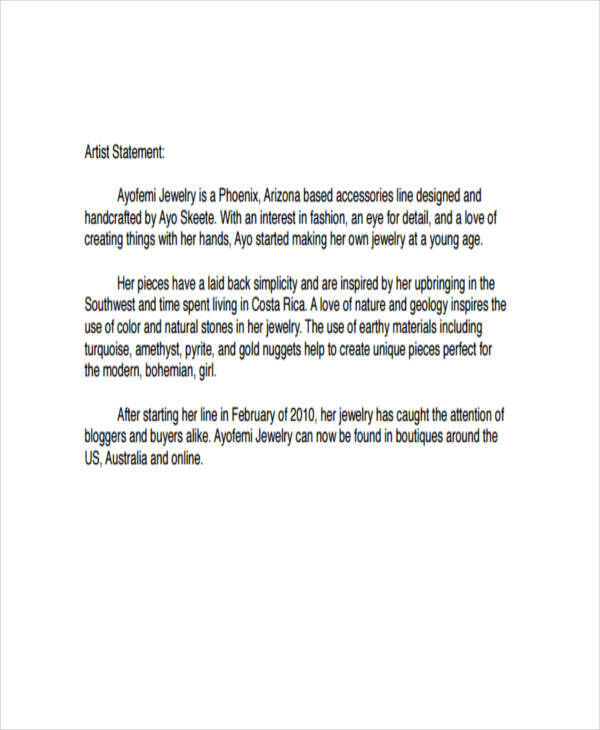 Summarize the whole content of your artist statement in a short paragraph. 2. Express the relevance and purpose of your work in one or two sentences. 3. Conclude it with your overall vision for your artwork. And write it as if you are writing a vision for a business statement.